Cape Fear Museum › Does Anybody Want Your Stuff? We Might. Does Anybody Want Your Stuff? We Might. Today, many baby boomers and Gen X’ers are charged with sorting and disposing of their family heirlooms after their parents move to smaller homes or pass away. Two Wilmington families contacted Cape Fear Museum for help. After her mother died, Tonye Gray was overwhelmed, “I was just drowning in all this stuff. And I was grieving.” Tonye reached out to Cape Fear Museum Historian Jan Davidson for advice about what to do. Tonye’s father, Dr. Samuel James Gray, was a physician, entrepreneur, and real estate developer. Born in Jamaica in 1912, he moved to the United States in 1930. He trained as a doctor at Howard University in Washington DC, and then moved to Wilmington, NC. Dr. Gray was Community Hospital’s first intern and he later went into private practice, serving Wilmington’s black population with offices on North 7th Street and finally 310 Davis Street. Dr. Gray owned a number of businesses in Wilmington and was involved in the early development of Ocean City, an African American beach community that was founded in 1949 on Topsail Island. In the 1950s and 1960s, he was one of three local African American physicians who sued James Walker Memorial Hospital for admitting privileges. 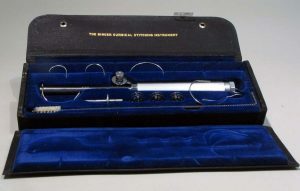 After losing their first case, the physicians won the right to practice at James Walker Memorial Hospital in 1964. Not long after this victory, Dr. Gray died in 1965. Tonye’s mother, Leona “Gwendolyn” Stinson Gray, was born in 1922 in Arkansas. She was a classically-trained concert pianist who attended the Julliard School. She graduated from Knoxville College in 1943, later earning a Masters from the American Conservatory of Music in Chicago. Gwendolyn came to Wilmington during the Second World War. 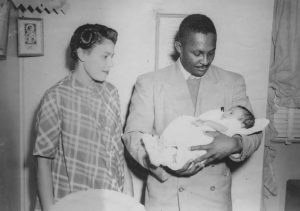 In 1949, Gwendolyn and Samuel James Gray married. The couple had three daughters – Diana, Charmaine, and Antoinette – and lived on South 11th Street. After Dr. Gray’s death, Gwendolyn stepped in to run the family’s businesses, including Greyhound Taxi, Rainbow Laundry, and Rainbow Barber Shop, even as she raised her daughters. Mrs. Gray died in 2014. For Katherine Beery, the process was a bit different, but still daunting. Her mother, Martha Blomberg Beery, was selling the family home. “We had about six weeks to leave,” Katherine says. Martha Blomberg Beery was born in 1926 in New Jersey and grew up in Bronxville, NY. She met William Beery III on a blind date while attending Skidmore College in Saratoga Springs, New York, and he was attending Rensselaer Polytechnic Institute in Troy, New York. The couple married in 1948. They had three children, William IV, Martha Ann, and Katherine. Martha Beery’s mother, Wilhelmina, knew Wrightsville Beach – she took a steamer from downtown Wilmington to the beach in the early 20th century. The Beery family settled into a home on Brookhaven Road in the Highland Hills neighborhood, in South Oleander. 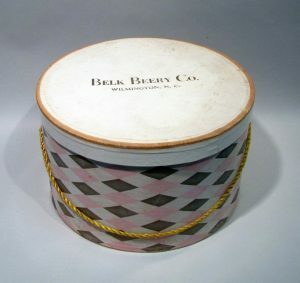 William Beery III was a partner in the Belk Beery Department Store business, as was his father, William Benjamin Beery Jr. William Jr. was married to Wilhelmina Katharine Futchs Beery. Her father was J.W.H. Futchs, who also ran a store in Wilmington. 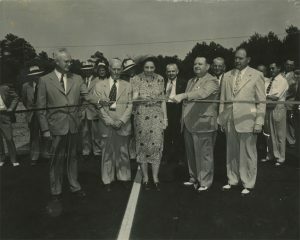 In 1951, the new Belk location was built at 201 Chestnut Street. Through the years, the Beerys grew their partnership with the Charlotte-based Belk. At the height of the Beery’s work, there were more than 20 Belk Beery stores from Wilmington to Asheville and south to Savannah, Georgia. Independence Mall opened in 1979 with Belk Beery as an anchor store. William III retired in the early 1990s and died in 1999. Katherine is a registrar at the NC Museum of History in Raleigh, so after the sale of the home, she helped her mother sort through items she had saved for her children and children. “It was all just too much,” Katherine says. So they decided to donate items to Cape Fear Museum. While she knew the museum would be interested in photographs and letters, she was surprised that we were interested in pieces of her own childhood history. “I was on the Azalea Festival parade float. We didn’t hold any kind of fresh flower or bouquets. We were given a large, paper azalea to carry. Mine was in, what I thought, wretched condition, but the curator took it,” Katherine says with a laugh. Katherine encourages families to start going through things in the house early. “My mother just didn’t do it,” she says. “I think she thought she would be there [in the house] for ever and ever and ever.” Katherine says all families will have to make decisions about what to do with their collections. “I see it every day, because I work in this field. We think that these things are more important than anybody else does. That’s the hard part,” she explains. “Sometimes, you’re surprised by what the institution wants. Other times you’re surprised that they don’t take things.” In all, Martha Beery donated more than 200 items to the Museum. It could be argued that the appreciation for family artifacts is dwindling. “It is scary that the next few generations don’t have the sentimentality I think that came from the generations of Depression-era,” Katherine explains. As homes are downsized and children are decluttering after the death of their parents, it is even more important to cherish and preserve the family artifacts that exist now. Cape Fear Museum collects, preserves and interprets objects relating to the history, science and cultures of the Lower Cape Fear region. If you have items you’d like to donate to the Museum, please contact Curator Heather Yenco at hyenco@nhcgov.com or 910-798-4359. More information can be found here.